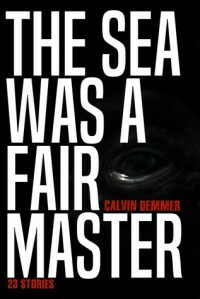 THE SEA WAS A FAIR MASTER is a top notch collection of flash fiction! I have always thought that flash fiction consisted of stories that were only a few sentences long. For example: "The last man in the world heard a knock at the door." That type of thing. I was wrong. Apparently flash fiction can be super short stories-say a page or two. Four to five. Six to seven. Now that I know the correct definition of flash fiction, I'll say this: I love it! I read a ton of single author story collections and multiple author anthologies throughout the year. I've done this since about the age of 12. It seems to me that stories back then were shorter than the tales these days. The last one I read had two stories that were the length of novellas. Not that I'm complaining, but I like my short stories to actually be short. These are! What I liked most about the tales here is that they were all dark, they had lots of variety, and they were ALL GOOD. Seriously, every single one of them made me feel something, made me think, made me chuckle, or made me marvel at how well written they were. My absolute favorite was YARA. Incredibly poignant and super short. It's amazing to me that such feeling and emotion can be communicated in only a few pages, but Calvin Demmer is a master at doing just that. LETTING THE DEAD GROW and HUMANS OR SNAKES were another two stories with disturbing imagery while at the same time being wildly creative. UNDERNEATH, BLIND TEDDY, REVENGE OF THE MYTH and VOODOO CHILD round out my absolute favorites. Usually I would tell you a little about each story, and/or about why I liked them so much, but these bite-sized pieces of entertainment are so short, I feel you need to go into them blind, as I did, and take from them what you will. I hope, (and I'm pretty darn sure), that you're going to like them as much as I, (and nearly everyone else who has read this book), did! If you like your short stories to be short, original, and have occasional punches to your gut? I doubt you could find a better volume than this.